UT Health San Antonio's radiologists deliver comprehensive nuclear medicine services with cutting-edge techniques. Our team is comprised of four board-certified physicians that have achieved subspecialized training through dedicated nuclear medicine residencies and fellowships such as nuclear radiology. White blood cell (WBC) infection imaging with simultaneous acquisition of radiolabeled WBC and bone marrow agent with SPECT subtraction. PET/CT Imaging for the detection of malignancy, initial staging, response to therapy and restaging of disease to include lymphoma (Hodgkin’s and non-Hodgkin’s lymphoma), lung, breast, ovarian, cervical, uterine, esophagealcolon cancer and many others. Myocardial SPECT Perfusion Imaging for diagnosis of myocardial ischemia and infarction via stress and rest and as needed viability imaging and a gated acquisition for the determination of left ventricular ejection fraction. 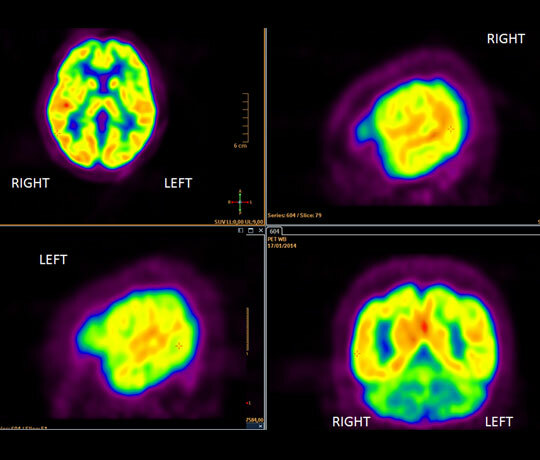 Dopamine Transporter Imaging (DaTscan) for the diagnosis of Parkinson’s disease. Brain Perfusion SPECT Imaging for intractable seizure localization with interictal and ictal SPECT brain scans subtraction and MRI image co-registration. Comprehensive Nuclear Medicine Endocrine Collaboration and Clinic for diagnostic evaluation and radiotherapy of hyperthyroidism and most thyroid cancers. Radiotherapeutic Microspheres for the Treatment of Liver Cancer with SPECT/CT pre-therapy and post-therapy imaging. Availability of two different Y-90 beta-emitting microspheres, Y-90 SIR-spheres for a more embolic therapy and Y-90Theraspheres for more specific radiation therapy and segmentectomy. Solid Gastric Emptying 4-hour study utilizes the standardized radiolabeled egg meal, simultaneous blood glucose levels, and patient symptoms to assess for delayed gastric emptying (gastroparesis) and rapid gastric emptying (functional dyspepsia). Availability of a standardized liquid carbohydrate glucose meal for assessment of carbohydrate gastric emptying. Parathyroid Imaging using SPECT/CT Imaging with capability for Parathyroid 4D-CT image fusion for the diagnosis of parathyroid adenomas and improved pre-surgical localization. Extensive Research Capabilities in Clinical Nuclear Medicine: Current phase I/II testing of a novel nanoparticle radionuclide therapy for the treatment of glioblastoma. This novel therapy has been developed in our radiology research laboratories and its clinical testing is an example of a bench to bedside initiative.